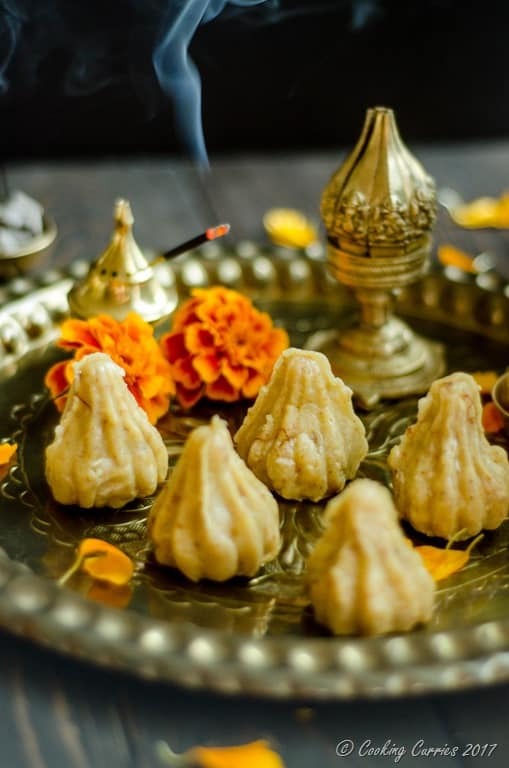 A twist on traditional Modak with this Chocolate Chip filled Coconut Khoya Modak, that can be made in about 15 mins for this Ganesh Chathurti. I always tell people that I am not very religious but I am very cultural. I love celebrating all festivals, religious and other wise. It reminds me of who I am, where I am from and brings back a lot of memories from my childhood as well as help create new memories with the husband and V.
From the innumerous Hindu mythological stories I have heard and read throughout my childhood and later, I have always found myself drawn to Lord Ganesha, I fondly call Gannu. I have a collection of Ganesha idols that I started collecting when I was way back in school. Again it is not in a strictly religious sense but if I were to have one favorite God from the Hindo mythology, it would be Ganesha. In fact, V’s name’s one meaning is Lord Ganesha himself. 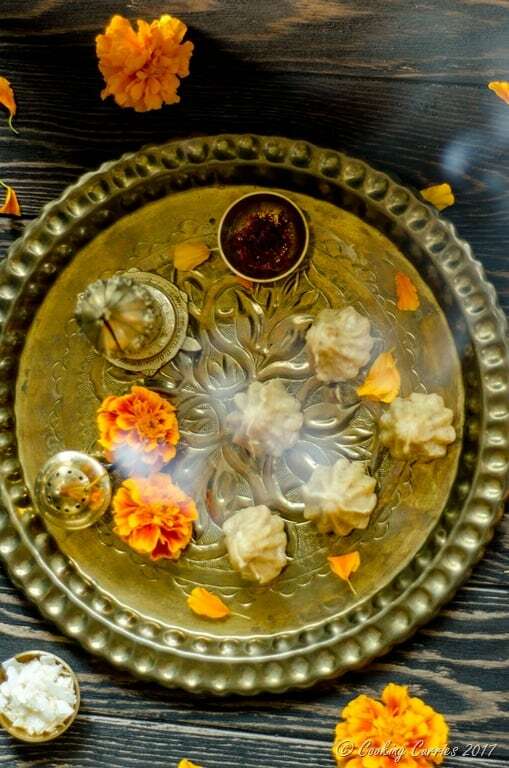 As per the mythological stories, Ganesha loved to eat and modak is one of his favorites! 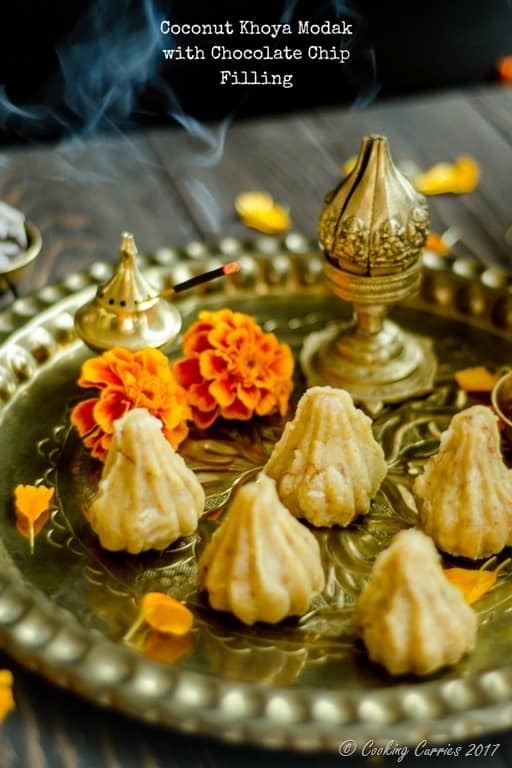 Ganesh Chathurti is a festival celebrating his birthday and all across India, those who believe and / or just celebrate make different types of modaks as offering for him. Modaks are essentially anything made in the form of this conical structure. They can be sweet or savory, with a filling or without, simple or complicated. 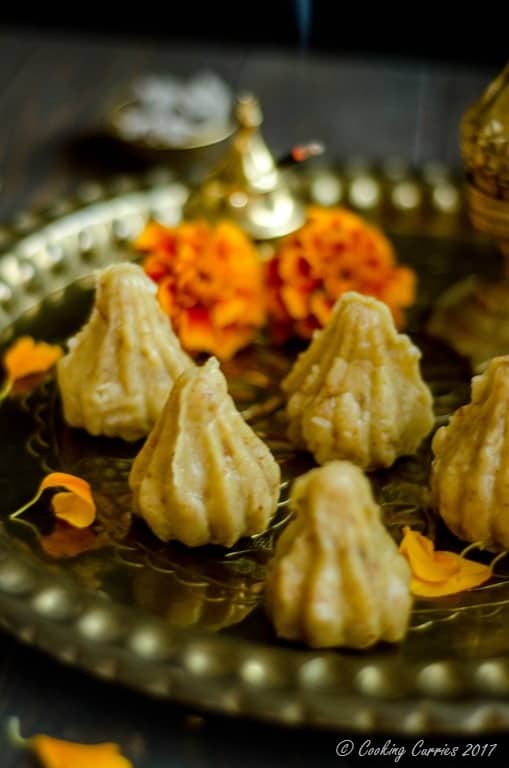 This Coconut Khoya modak that I made is one of the easiest that you can make. It will take you less than 15 mins to get it all done. The chocolate chip filling is just a little surprise here, you can feel free to skip it. It is for the little Ganesha in our house as he loves chocolate! My favorite kind is however the simple kozhukkattai that amma always makes for Ganesh Chathurti, a steamed rice dumpling with a coconut-jaggery filling perfumed with cardamom. Last year, my parents were visiting us here in Seattle and Amma made enough for us to eat and some to freeze to enjoy later as well. I will hopefully get the recipe for that for you guys soon! Till then, enjoy my quick and easy Coconut Khoya Modak with the surprise Chocolate Chip filling. In a kadhai or heavy bottomed pan, heat the khoya over medium heat till it all comes together to one solid mass. Add the coconut, sugar, cardamom and saffron and cook till the sugar has melted and it absorbed with the khoya. It should be a loose dough like consistency. Remove from heat and let it cool, till it comfortable to work with. 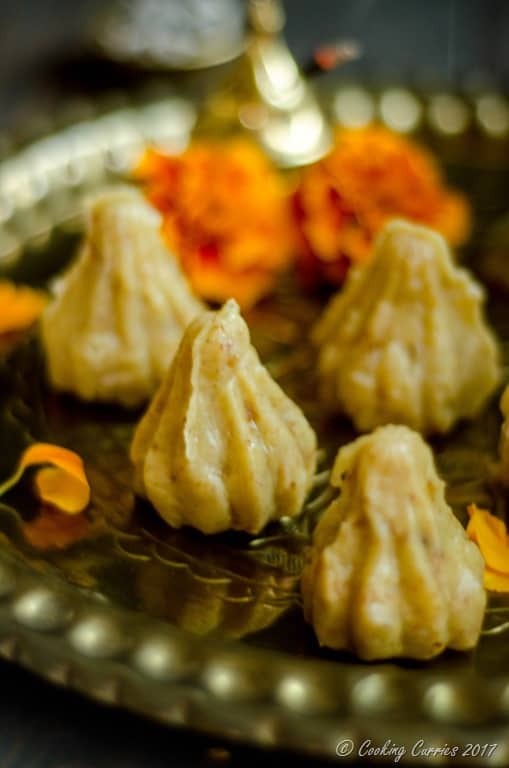 Use a modak mold or with your hands shape into a conical structure. Fill one or two chocolate chips in each modak and shape it again. If required, keep it refrigerated for about 10 mins to help it set.